After 15 years of research and extension, BioGro technology is mature. BioGro can reduce needs for chemical nitrogen fertiliser by up to 50% and has many other advantages. The list of 22 publications including three books following this article attests to this fact. Quite justly, it can be stated that the effectiveness of BioGro as a biofertiliser has been shown to be ‘second to none’. Biogro now has more scientific validation in the laboratory, in the factory and on the farm than any similar biofertiliser product on the earth. During the ACIAR-AusAID project more than ten different factories have been in production, one for the entire period and others commencing and ceasing production. There have been two basic production models – factories that are commune-based (Model 1) and factories that are owned by commercial private companies (Model 2). These can be broken down into factories that only manufacture and are not directly involved in marketing (Model 2A), and factories that manufacture and sell the product to farmers. This final category can be further distinguished between companies that sell only BioGro (Model 2B), and factories that sell many products (Model 2C). Figure 4 shows the current (and past) producers within their production model category. Model 2B is the most common: factories operating as a private commercial business that produce and market only BioGro. Commune-based factories, run by local farmers and selling the product locally, were initially envisaged as a suitable and appropriate way for BioGro to be produced and sold (Barrett and Marsh 2002). However, all commune-based factories operating in this way have ceased production. Those that have continued, the Ba Vi and Thanh Hoa factories, have changed their operational structure. The core problem that faced commune-based production, with farmers producing and selling to local farmers, was a lack of business acumen, which resulted in marketing difficulties in general and collecting monies owed by farmers in particular. The Ba Vi factory in Ha Tay province was the first to produce BioGro in Vietnam. Grant money in 1999 from the Global Fund for the Environment for a 3-year project entitled ‘Improvement of soil fertility for poor soils in Ba Vi’ was the seed money for this factory. The first batch of 20 tonnes of biofertiliser was produced in 2000 and the project finished in 2002. At this time the local commune took over management of the factory and 11 people from the commune formed a cooperative to produce BioGro. However, within two years the cooperative faced marketing and financial difficulties, and a family from the commune took over the management. 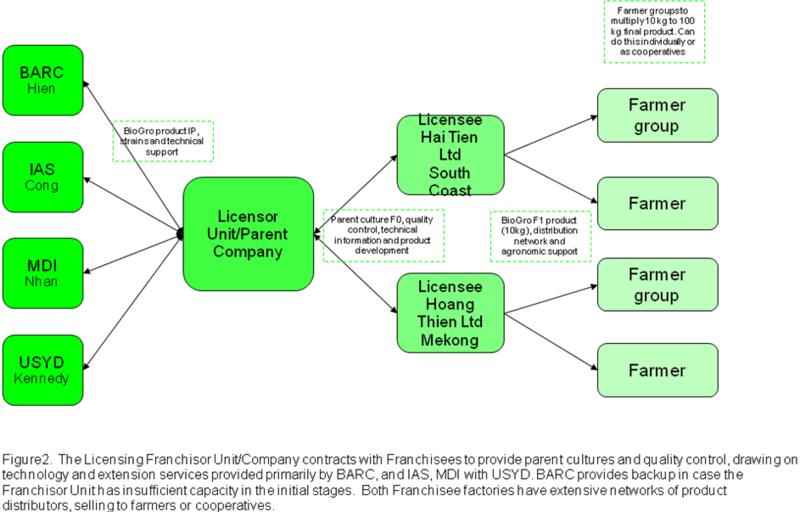 This arrangement also ran into marketing difficulties and in 2006 Vietnam Agricultural Organic Company took over the distribution and sale of the product. The Ba Vi factory is the longest continuously operating BioGro factory and has had a variable production per year ranging from 15 tonnes in 2006 to 650 tonnes in 2004, and averaging 190 ton/year between 2000 and 2006. Thanh Hoa factory started in 2002 as a commune-based operation producing for local farmers, with the assistance of a Non-Government Organisation (NGO) which helped with the business operations. This operation was small but reportedly successful (Le 2006), but when the NGO withdrew support the business transferred to private ownership (Dat Viet Company) in 2005, because the ‘farmers could produce but not sell’. As discussed earlier, the Ba Vi factory now operates in this model. The commune-based producer said that he faced challenges because of delayed payments from purchasers, and that he ‘can only produce but not distribute or sell’. The Hoa Lac factory in Ha Tay province, operating since 2001, is the only factory operating mainly in this model. Some product is sold to farmers, but mainly production occurs specifically to meet government contracts. This producer has contacts within government, and does not conduct any extension or trials with the product. The factory has produced consistently between 2002 and 2006 with a production average of 280 tonnes/year during that time. During 2007 it appeared that contracts previously available would not continue, and there was no production during this year. Factories operating in this model have tended to go in and out of production for a number of reasons, but all related to marketing and management issues. Three factories currently remain in operation: Dat Viet factory (who took over the Thanh Hoa factory), and factories in Pleiku and Nha Trang. These latter two factories have been in production for less than two years. Dat Viet factory has been in production for three years, producing consistently around 350 tonnes of BioGro per year. The owners of the Dat Viet factory are young and enthusiastic and understand their product well. They have links through the business structure of their company to farmers with land in excess of 2000 hectares, which previously belonged to two State Owned Enterprises that are now equitised. The company produces to orders from these large farms, and organises training for farmers on how to use BioGro and works with local extension agents to run trials and demonstrations. The company supplies farmers via a distribution agency which is responsible for collecting payments for the product. The Bai Bang factory in Phu Tho province is no longer in operation, but when it commenced operation it was thought that it could prove to be a successful model. The factory operated for two years and produced 550 tonnes of BioGro per year. The BioGro production was linked to the waste material for a paper factory: waste material from the paper factory was used to produce compost which was in turn was the carrier medium for the BioGro, instead of peat. Two staff of the laboratory worked at Bai Bang for six months to train 10 staff of the company how to produce compost and BioGro. However the company failed to understand that they would need to conduct trials and promote the product. The chairman of the company said that the product was ‘perfect’ and people should come to the company to demand the product. Training for farmers using BioGro was not sufficient, and within two years the company was having difficulty in marketing such a large quantity of BioGro and production ceased. No factories remain operating in this model. The Thai Ngyuen factory ran for three years, producing over 300 tonnes at its peak in 2004. The factory ran into difficulties because, despite the best efforts of the laboratory, the producer didn’t understand the product well and advocated its use in inappropriate ways, for example, completely replacing chemical fertiliser, in an effort to develop the market. Trials were conducted by the producer over too large an area and were not adequately supervised. After failures farmers stopped buying the product and production ceased. In recent years, in a period supported by the World Bank Development Marketplace, two new approaches have been subject to trials for commercial viability. This is against a background in which the effectiveness of the BioGro technology is well established (see publications listed below). Model 3A: Franchising or licensing BioGro technology to commercial producers. In principle, this is similar to Model 2C involving production by private companies. However, the portfolio of activities is more strongly developed, with a strong emphasis on maintaining quality control. The structure of the model is indicated in Figure 2. Although much interest has been expressed in this model, there has been little or no uptake. Issues concern the ownership of the technology (that resides in BARC or AGF), marketing of the product and the lack of sufficient incentive to change farming practices. This might be overcome with greenhouse credits for reduced greenhouse gases, or a premium price for more sustainable production. Model 3B: The 2013 Recycling Da Lat Waste Composting and BioGro model, involves a licensed venture with combined purposes. In Da Lat, Danish funding has built a waste disposal factory, with ongoing contracts to composting of organic city waste. The residue is then employed to provide carrier for BioGro, including other sources of lingo-cellulose waste such as coffee husks. In the Da Lat case, the BioGro so produced is then sold locally to producers of high value produce, such as floriculture. In Da Lat, Mr Duy is the entrepreneur managing the Waste Composting/Biogro production, with contracted sales to floriculture producers who are prepared to apply high rates of BioGro. BARC benefits from the licensing, and provision of microbes for composting and BioGro production. Pham Bich Thuy of Environmental High Technology Development Joint Stock Company has promoted this development and would be key to future expansion. For example, Mr Dinh of Dak Lak Province (Tuyen Quang) is promoting a similar link between dairy production (VinaMilk) and tea production. Recent changes mean that agro-industries must seek more sustainable solutions to waste disposal. A similar composting of dairy waste linked to BioGro production for fertilization of tea plantations in the same district is proposed. In effect, this kind of licensing arrangement could be franchised under favourable local conditions throughout Vietnam. City waste, agricultural waste including aquapond mud could be used as feedstock for BioGro production. Commercially, this would be more likely to succeed since two problems would be solved in one action for producing BioGro. Biofertilisers in Action Kennedy, I.R. and Choudhury, A.T.M.A. eds., ISBN 0 642 58485 0, Rural Industries Research & Development Corporation, 02/86, 135 pages, Barton ACT, 2002. Efficient nutrient use in rice production in Vietnam achieved using inoculant biofertilisers. Kennedy, I.R., Choudhury, A.T.M.A., Kecskes, M.L. and Rose, M.T. (eds.) (2008). Proceedings of a project (SMCN/2002/073) workshop held in Hanoi Vietnam, 12-13 October 2007, ACIAR Proceedings No. 130 137 pp., Canberra ACT. Kennedy, I.R. and Roughley, R.J. (2002) The inoculant biofertiliser phenomenon and its potential to increase yield and reduce costs of crop production: The need for quality control. In: Kennedy, I.R., Choudhury, A.T.M.A. (Eds.) Biofertilisers in Action. RIRDC, Canberra, ACT, Australia, pp. 4-10. Nguyen, T.H., Kennedy, I.R., and Roughley, R.J., (2002) The response of field-grown rice to inoculation with a multi-strain biofertiliser in the Hanoi region, Vietnam. In: Kennedy, I.R., Choudhury, A.T.M.A. (Eds.) Biofertilisers in Action. RIRDC, Canberra, ACT, Australia, pp. 37-44. Islam, N., Rao, C.V.S. and Kennedy, I.R. (2002) Facilitating a N2-fixing symbiosis between diazotrophs and wheat. In: Kennedy, I.R., Choudhury, A. (Eds.) Biofertilisers in Action. RIRDC, Canberra, ACT, Australia, pp. 84-92. Williams, R.L. and Kennedy, I.R. (2002) A model for testing the effectiveness of biofertiliser for Australian rice production. In: Kennedy, I.R., Choudhury, A.T.M.A. (Eds.) Biofertilisers in Action. Rural Industries Research and Development Corporation, Canberra, ACT, Australia, pp. 112-114. Kennedy, I.R. (2008) Overview of project objectives and experimental outcomes. In Efficient nutrient use in rice production in Vietnam achieved using inoculant biofertilisers. Kennedy, I.R., Choudhury, A.T.M.A., Kecskes, M.L. and Rose, M.T. (eds.) (2008) Proceedings of a project (SMCN/2002/073) workshop held in Hanoi Vietnam, 12-13 October 2007, ACIAR Proceedings No. 130, pp. 9-14, Canberra ACT. Kecskés, M.L. Choudhury, A.T.M.A. Casteriano, A.V., Deaker, R., Roughley, R.J., Lewin, L., Ford, R. and Kennedy, I.R. (2008) Effects of bacterial inoculant biofertilisers on growth, yield and nutrition of rice. In Efficient nutrient use in rice production in Vietnam achieved using inoculant biofertilisers. Kennedy, I.R., Choudhury, A.T.M.A., Kecskes, M.L. and Rose, M.T. (eds.). Proceedings of a project (SMCN/2002/073) workshop held in Hanoi Vietnam, 12-13 October 2007, ACIAR Proceedings No. 130, pp. 49-58, Canberra ACT. Rose, M.T., Tran Minh Hien, Tran Thi Kim Cuc, Nguyen Duc Hoang,Phan Thi Cong and Kennedy, I.R. (2008) Effects of bacterial inoculant biofertilisers on growth, yield and nutrition of rice. In Efficient nutrient use in rice production in Vietnam achieved using inoculant biofertilisers. Kennedy, I.R., Choudhury, A.T.M.A., Kecskes, M.L. and Rose, M.T. (eds.). Proceedings of a project (SMCN/2002/073) workshop held in Hanoi Vietnam, 12-13 October 2007, ACIAR Proceedings No. 130, pp. 67-75, Canberra ACT. Mihály L. Kecskés, M.L., Rose, M.T., Tran Thi Kim Cuc, Nguyen Kim Oanh, Michel, E., Lauby, B., Rakotondrainibe, M. Casteriano, A.V., Palágyi, A. Krishnen, G. and Kennedy, I.R. (2008) Identification and quality control of BioGro inoculant biofertiliser strains. In Efficient nutrient use in rice production in Vietnam achieved using inoculant biofertilisers. Kennedy, I.R., Choudhury, A.T.M.A., Kecskes, M.L. and Rose, M.T. (eds.). Proceedings of a project (SMCN/2002/073) workshop held in Hanoi Vietnam, 12-13 October 2007, ACIAR Proceedings No. 130, pp. 117-125, Canberra ACT. Kennedy,I.R. , Rose,M.T., Kecskés, M.L., Roughley, R.J., Marsh, S., Phan Thi Cong, Tran Thanh Be, Pham Van Toan and Nguyen Thanh Hien (2008) Future perspectives for biofertilisers: An emerging industry needing a scientific approach In Efficient nutrient use in rice production in Vietnam achieved using inoculant biofertilisers. Kennedy, I.R., Choudhury, A.T.M.A., Kecskes, M.L. and Rose, M.T. (eds.). Proceedings of a project (SMCN/2002/073) workshop held in Hanoi Vietnam, 12-13 October 2007, ACIAR Proceedings No. 130, pp.131-136, Canberra ACT. Nguyen Thanh Hien, Deaker, R. Kennedy, I.R. and Roughley, R.J. (2003) The positive yield response of field-grown rice to inoculation with a multi-strain biofertiliser in the Hanoi area, Vietnam. Symbiosis 35, 231-245. Kennedy, I.R., Choudhury, A. T. M. A. and Kecskés, Mihály. (2004) Non-symbiotic bacterial diazotrophs in crop-farming systems: Can their potential for plant growth promotion be better exploited? Soil Biology & Biochemistry 36, 1229-1244. Choudhury, A.T.M.A., and Kennedy, I.R. (2004) Prospects and potentials for systems of biological nitrogen fixation in sustainable rice production. Biology and Fertility of Soils 39, 219 – 227. Choudhury, A.T.M.A. and Kennedy, I. R. (2005) Nitrogen fertilizer losses from rice soils and control of environmental pollution problems. Communications in soil science and plant analysis 36, 1625-1639. Choudhury, A.T.M.A, Kennedy, I.R., Ahmed, M.F. and Kecskes, M. (2007) Phosphorus fertilisation for rice and environmental pollution problems. Pakistan Journal of Biological Sciences 10, 2098-2105. Kecskés, M. L., Rose, M. T., Michel, E., Lauby, B. Rakotondrainibe, M., Casteriano, A., Palágyi, A., Moutouvirin, A., Elter, S., Guillas, R., Krishnen G., and Kennedy, I. R. (2009) Rapid immuno-monitoring of inoculant plant growth-promoting microorganisms. Engineering in Life Sciences 9, 431-436. Phan Thi Cong, Tran Dang Dung, Tran Minh Hien, Nguyen Thanh Hien, Choudhury, Abu T.M.A., Kecskés, M.L. and Kennedy, I.R. (2009) Inoculant plant growth-promoting microorganisms enhance utilisation of urea-N and grain yield of paddy rice in southern Vietnam. European Journal of Soil Biology 4 5, 5 2 – 6 1. Cong, P.T., Tran, D., Nguyen, H., Choudhury, A.T.M.A, Rose, M. T., Kecskes, M. L., Deaker, R., Kennedy, I.R. (2011) Effects of a multi-strain biofertiliser and phosphorus rates on nutrition and grain yield of paddy rice on a sandy soil in southern Vietnam. Journal of Plant Nutrition 34, 1058-1069. Amprayn, Khanok-on, Kecskes, Mihaly L., Krishnen, Ganisan, Pereg, Lily, Rose, Michael T., Nguyen, Thanh Hien and Kennedy, Ivan R. (2011) Plant growth promoting characteristics and colonisation pattern of rice roots by Pseudomonas fluorescens Submitted in 2013. Copyright © 2019 Trung tâm Nghiên cứu & Ứng dụng Phân bón Vi sinh.